Paul Chapman is Chief Information Officer at Box, where he is responsible for leading the company's global information technology strategy. 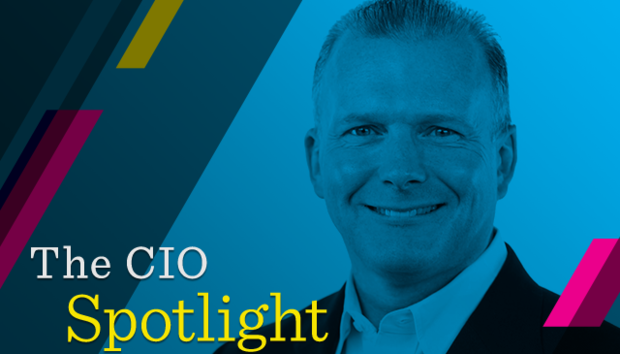 He brings a unique view of IT innovation and drives the development and delivery of key IT initiatives to support the company's growing workforce and customer base. Prior to Box, Chapman was the CIO of HP Software for HP, where he led the IT organisation and supported the deployment of IT solutions for this multi-billion-dollar business. What was your first job? By day, I was a COBAL programmer. But in the evenings, I worked at Toys R Us. I was the 'Big Ticket Person' - the staff member who collected the large items at the back of the store. That role meant I could avoid the shop floor itself, where you had to wear a highly embarrassing orange and white striped shirt. I couldn't handle that, for obvious street cred reasons. Did you always want to work in IT? Yes. But it wasn't called IT back then... there were computer operators, computer programmers and data processing and I chose the computer programming path. Explain your career path. Did you take any detours? If so, discuss. Aside from my stint at Toys R Us, I've been working in technology my entire career. I started out as a programmer, moved on to IT management with Sun Microsystems and senior roles at Affymetrix and VMware. In 2014 I became CIO of HP Software for HP and I'm now CIO at Box, where I'm responsible for leading the company's global information technology strategy and cyber security organisation. What business or technology initiatives will be most significant in driving IT investments in your organisation in the coming year? Machine learning services are driving our investment for the next 12 months. We're looking at two areas in particular, both of which are underpinned by machine learning. The first, digital labour, effectively automates standard, repeatable mundane steps that a human typically performs. (Often skilled but standard repeatable.) The second, digital assistants, involves pushing intelligence, predictions and suggestions to make employees more productive by giving back the gift of time. What are the CEO's top priorities for you in the coming year? How do you plan to support the business with IT? Our CEO, Aaron Levie, has priorities that are consistent with last year. We're focusing on workplace productivity, enabling our employees to be as productive as possible and do their best work. We focus on taking the work out of work and building seamless and friction-less experiences for our employees. Scaling and automating our business processes to allow us to scale and grow. Being a referenceable example of what a best of breed, born in the cloud architecture looks like. Making the most of our own Box services as we continue to be our first and best customer! Does the conventional CIO role include responsibilities it should not hold? Should the role have additional responsibilities it does not currently include? The span of responsibility of the CIO role can vary from company to company. There are normally a set of common functions, for example enterprise systems, end user services, and technical operations, but then can vary from there. Other areas I've seen the CIO be responsible for may include product operations, cyber security, compliance, facilities, strategic sourcing, and business unit GM responsibilities. Are you leading a digital transformation? If so, does it emphasise customer experience and revenue growth or operational efficiency? If both, how do you balance the two? Personally, I think the term digital transformation is being overused and quite abstract and vague. It is a way to explain moving from a previous way of operating to a new way of operating and a new way of thinking. but this no different to modernising and evolving as we've done for decades. Every company has had to transform themselves to stay relevant - the digital aspect is just a way of comparing modern operations to the past way of doing things. Describe the maturity of your digital business. For example, do you have KPIs to quantify the value of IT? Box has grown up as a digital company. Whilst not everything we do is digitised, we have a mindset of being a digital company with a digital culture that is constantly evolving, forward thinking and innovative. We have a modern reference architecture which makes this constant evolution possible. It provides us with greater agility and scalability and allows us to rapidly pull in the best of breed innovation from the ecosystem of platforms and services that we subscribe to. This is why I am such a strong proponent of building a best of breed architecture. What does good culture fit look like in your organisation? How do you cultivate it? We focus on the culture fit at the hiring stages. At Box, we believe that if you've made it to the final interviews, it's a given that you have the skills/experience we require. The decision then comes down to whether you'll fit within the culture of our organisation. I believe the professional chemistry of who you work with and for is extremely important. In the Box IT team in particular, people like who they work with and who they work for. You can see it in the team - there is an energy and levels of motivation that transpires because of the camaraderie and positive energy. What roles or skills are you finding (or anticipate to be) the most difficult to fill? Cyber-security skills are an area we're focusing on right now. However, I believe that technology roles are constantly evolving, so when you need people for specific roles that may not be readily available in the market, you organically build them within your organization. It's not like you wake up one day and there is a big skill gap. Technology professionals must always be re-inventing themselves to stay relevant. As technology evolves, so too do the people and roles around it. What's the best career advice you ever received? Get comfortable with being uncomfortable because it's not going to change any time soon. Do you have a succession plan? If so, discuss the importance of and challenges with training up high-performing staff. I do but it's an informal succession plan. It is based somewhat on timing and ensuring people are well-rounded in their skills and responsibilities. I am constantly looking for ways of reducing areas of codependency by focusing on hiring the right people, all with the goal of building the best teams possible - complete with natural leaders and the ability to function independently. What advice would you give to aspiring IT leaders? The pain of change is mandatory, it is the suffering that is optional. If and if you don't like change, you are going to like irrelevance even less. What has been your greatest career achievement? I like being able to leverage my network and experience to provide professional career opportunities to people from non-traditional hiring pathways. Talent is global, but opportunity is not. Finding talent and creating opportunities for others that through no circumstance of their own were afforded less opportunity is important to me. Looking back with 20:20 hindsight, what would you have done differently? I would have built up my external network and contributed to the external IT community much earlier in my career. You have to curate over an extended period of time, so there is no accelerated option here. Most people don't know that I… I love scuba and shark diving. In my spare time, I like to…Run. I just did a half marathon in Las Vegas. Ask me to do anything but… Performance reviews. I understand the purpose and the importance but I'm a big believer in ongoing coaching and feedback, course corrections and adjustments. If you're really good at something then keep doing it, and if you're not, don't worry about it - we can make adjustments as we go. The use of a stop and go measuring system creates more organisational stress and thrash than it should.